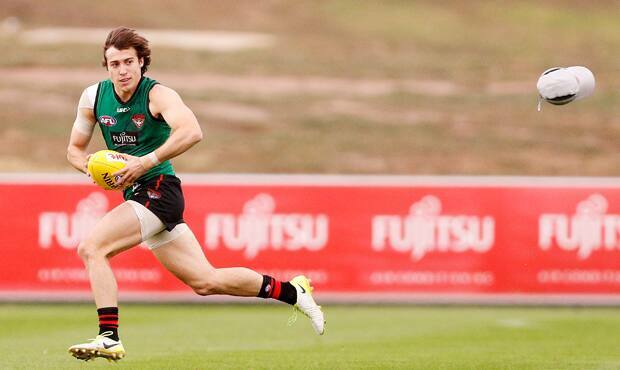 Andrew McGrath is still learning his new midfield role for the Bombers. Andrew McGrath made a seamless transition from under-18 footy to the top level last year, becoming only the second Essendon player to win the NAB AFL Rising Star. He played on – and beat – some of the game's leading small forwards, and was swiftly a key member of the Bombers' line-up and a big part of the club's future. So much so that the Bombers have wasted no time in moving McGrath out of the backline and in the midfield, where he has started this season. A change of 'line' made for a different pre-season, leaving McGrath sore and bruised at the end of every week after collisions with teammates. And it has also made for some different expectations for McGrath, who started his year with a terrific performance against Adelaide in round one (26 disposals and a goal) before, like his team, being quieter against Fremantle and the Western Bulldogs the past two rounds. Last week he pushed into the backline after a late withdrawal for the Bombers, but the 19-year-old told AFL.com.au he is keen to have a bigger impact around the ball. "It's been a bit hit and miss. I've shown why I want to play in the midfield and what I can do in there, but to not execute on that consistently in the first three weeks has been frustrating for me," McGrath said. "My main goal is to impact the game and move the game forward, break the lines and open up the game to give the forwards chances one-on-one. That's one of the main focuses of my game. I feel like I've done that in patches in the first couple of rounds but not consistently enough." McGrath found his feet quickly in Essendon's senior side last year, debuting in round one against Hawthorn, playing 21 of a possible 23 games and averaging 20 disposals. Despite his calm and composed nature, McGrath says he didn't feel at home until after round five. "After that I thought 'Yep, I'm an AFL footballer, I'm ready to play this sport at this level', which was comforting to know," he said. Observers could tell that already. Just as they have been able to see the determination of the club's first ever No.1 draft pick this year to have the same impact on games further up the ground. McGrath says he was able to reflect on last year's successes for "a little bit" over summer, but that he had pushed it to the back of his memory bank as he aims to continue his rise. "A lot of people mention 'second-year blues' and things like that, but I'm constantly wanting to improve every year I'm in the League and that's no different this year to last year. I won a few things but that's all behind me now, and I just want to improve as a footballer and as a person too," he said. "You go from in your first year fighting to keep your spot to now really wanting to impact games and take that next step in my football." Part of that has been backing his instincts and having the confidence to communicate more on the field. "I tend to see a lot of things on the field and don't always say it being a younger player, which is something I'm working on now," he said. "It's natural when you're the youngest to be a little more conservative, but now being a second-year player and playing a fair chunk of AFL footy, you feel confident enough to pull blokes up on certain things and give more feedback." Essendon faces Port Adelaide on Sunday after losing its past two games, with last week's defeat to the Bulldogs particularly disappointing. McGrath admitted the successive defeats did "rattle" the team's self-belief a little, but that they are still optimistic about the club's hopes in 2018 after last year returning to the finals. "We know we have a strong list and we're always looking to improve. Expectations are up in the air, but I don't think as a playing group we really worry too much about that," he said. "We want to improve on what we did last year and we know we have in the pre-season that we had. We're still very confident we can play the Essendon brand of footy that we've trained for four months in the pre-season."